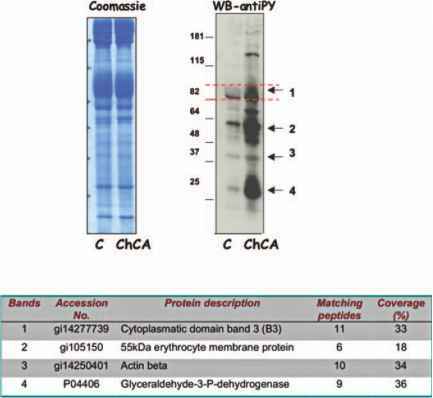 Using an antibody against the cytoplasmic domain of band 3, we found specific immunoblot patterns in the membrane fractions of erythrocytes from patients with ChAc, MLS and HDL2 (Fig. 1). 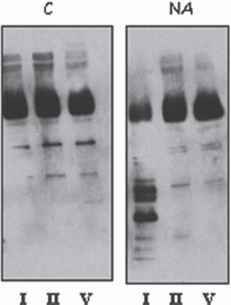 Aberrant immunoblot patterns were also obtained with anti-Diego and anti-phosphotyrosine antibodies . These data suggest that the presence of acanthocytes in patients with various forms of NA is associated with, as well as characterized by, specific changes in the conformation of band 3 . Based on immunoblot data obtained with antibodies of various specificities, these changes are likely to affect not only the interaction between cytoskeleton and lipid bilayer, but also the interaction of band 3 with other integral membrane proteins, and with cytosolic proteins. These changes may affect erythrocyte metabolism, either through the anion transport activity, or through binding and inactivation of enzymes such as aldolase and GAPDH. In order to determine whether the NA-specific changes in band 3 structure are specific for the acanthocytes or for all erythrocytes of a NA patient, we separated the erythrocytes from an HDL2 patient into different populations using a combination of volume (counterflow elutriation) and subsequent density (Percoll gradient) centrifuga-tion, that has been developed for the isolation of erythrocytes of various ages . The acanthocytes were concentrated in the fraction which, in control donors, consists of the oldest, most dense and smallest erythrocytes (fraction V in ). In the samples from the HDL2 patient, this fraction consisted of 95% acanthocytes, whereas the other fractions consisted for maximally 15% erythrocytes with an echinocytic/acanthocytic morphology. This is in agreement with previous analyses showing that acanthocytes from a patient with chorea-acanthocytosis were concentrated in the high-density layers of density gradients . Immunoblot analysis showed an aging-related increase in band 3 degradation in control erythrocytes (Fig. 2), as reported before . The NA-related changes observed in the total erythrocyte populations were observed in all fractions, but especially in the fraction that contains hardly any acanthocytes and that, in control donors, contains the youngest erythrocytes (fraction I in Fig. 2). These data suggest that NA-related alterations in band 3 structure are not associated with the presence of acanthocytic morphology per se. We hypothesize that these alterations may reflect a NA-related imbalance in the erythrocyte membrane stability that, during the lifespan of the erythrocyte, leads to the appearance of acanthocytes. brane tyrosine phosphorylation pattern in MLS erythrocytes compared to normal controls (Fig. 4). In particular, we found increased tyrosine phosphorylation of proteins with molecular weights between 115 and 181 kDa and a band around 82 kDa, without major differences of bands in the lower molecular weight regions. 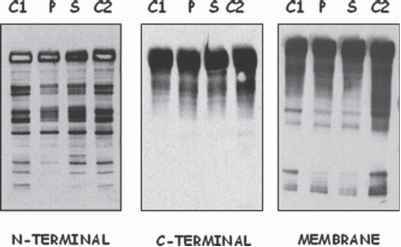 The bands that are differently phosphorylated are now being identified by MALDI-TOF analysis. We have already identified one of the bands as P-spectrin. 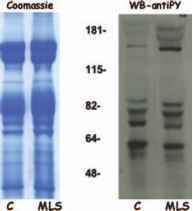 It is interesting to note that abnormal tyrosine phosphorylation of spectrin is also present in ChAc erythro-cytes (Fig. 3), suggesting a perturbation of the functional connections between the red cell membrane and the cytoskeleton in both disorders. Changes in the tyrosine phos-phorylation state might alter spectrin stability and thereby the spectrin network and cytoskeleton organization . Recently, a three-dimensional computational study of the equilibrium between shape and deformation in red cells, using spectrin-level energetics, has shown that the spectrin network is constantly remodelled in any red cell shape [14, 15]. These data implicate a crucial role for the membrane-anchoring sites, including the band 3-ankyrin bridges between the erythrocyte membrane and the spectrin-based cytoskeleton, in maintaining optimal cell morphology. These data further support the hypothesis that the generation of acanthocytes is related to a perturbation of the erythrocyte membrane network, associated with abnormalities in the tyrosine phosphorylation state of various proteins, which may result in an abnormal modulation of either membrane protein-protein or membrane protein-lipid bilayer cross-talk.